12V panel mounted red LED warning light. 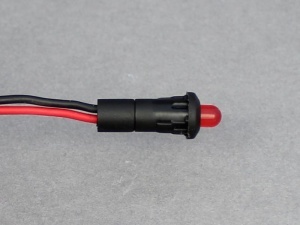 The LED is mounted in a black plastic housing with connection via un-terminated flying leads. The LED illuminates constantly when +12V is applied. 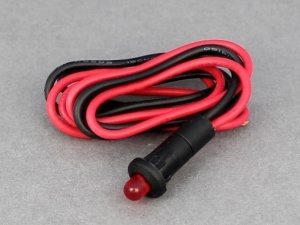 Note: LED is polarity sensitive: red wire must be connected to +12V and black wire to 0V/ground. Press fits into an 8mm dia. hole. Great LED light and very fast shipment!